I’m going to come clean with you all here. I am going to tell you something I have never shared before because, quite frankly, it is embarrassing and I should have known better. A few years back, I was in serious financial trouble. I could blame it on my husband and his bipolar disorder but that would be too easy. Yes, it did not help matters that he had to go off work for almost two years, but it was my inability to face our money troubles head on and make adjustments when clearly our finances were a mess. We almost had our home taken away. We routinely were threatened with our services being cut off and pay days were a nightmare for fear that creditors would swoop in, in the middle of the night, and clear my bank account, leaving me with absolutely nothing for the next two weeks. It was such a stressful time and I was constantly filled with anxiety. When I look back now, I can see where I went wrong. I didn’t stay on top of things, made really poor decisions that affected our finances for many years to come, and I refused to adjust our spending habits when our income was cut. So if you are currently in a position similar to what mine was, facing a large stack of unopened bills shoved in a drawer somewhere, let me say, I know exactly how you feel. My first instinct was to ignore the drawer and pretend it didn’t exist. Because honestly, it’s scary and over-whelming. But I knew what I had to do. I had done it before. When I was a newly divorced, single mother, I had no choice but to budget. I learned a lot and I made great progress back then. I was eventually able to provide for myself and my children all by myself. I did it then. I could do it now and so can you. The first step is to put your big girl pants on, stop ignoring the big pink debt elephant in the room and get to work. If you are ready to get off the hamster wheel and break the cycle of living paycheck to paycheck, here is my process, step by step, to get back on track when your finances are a mess. 1. Get a clear snapshot of your current financial situation. How bad is it? You need to know exactly where you stand. Only then can you make actionable goals to tackle your debt. On my other site you will find this post, How to start a budget. 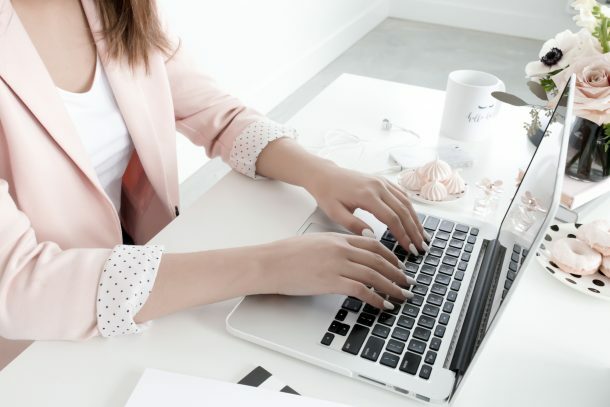 There you will find the steps you need to take to gather all the information you need to get a clear view of your current financial situation. Don’t forget to download and print the free printable. 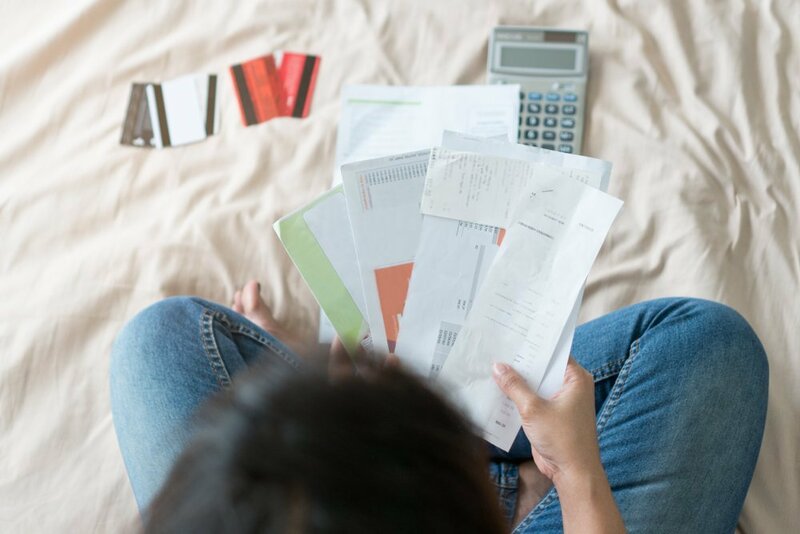 Now that you have all of your numbers in front of you, it is time to find where the biggest spending errors are and what debts need to be tackled. 3. Don’t play the blame game. It is what it is. You are here now and you are going to do something about your situation, so there is no point in beating yourself up with the “you should have known betters.” In order to move forward and make true progress, it is important to know the why and how you created this present situation so that you can prevent a repeat but don’t let yourself get stuck in remorse. Consider those mistakes a lesson and remember them. 4. Set specific goals and timelines. I have researched the vacation I want and it will cost me $2,500. I need to have this amount by October 2019 to be able to pay for the trip I want to take in February 2020. The more specific and time stamped your goals, the easier it is to plan the course to accomplish them. You must be very clear. Include dollar amounts and dates. Don’t worry about being too enthusiastic or optimistic. Now that you have very specific goals and deadlines, you work backwards in order to know what you need to do every day to make sure you achieve them. If you need to pay off $25,000 in 18 months, you need to reduce your debt by $25,000/18 monthly or $1389/month. If you currently get paid bi-weekly, that’s $641/bi-weekly. How are you going to be able to put that amount directly on your debt monthly? Again, be specific. If you have completed steps one and two above, it will help you find more money saving opportunities to reach your goals. After intense examination, if you find that your goal is unachievable, extend your timeline and adjust your numbers. The worst thing you can do is put too much stress on yourself and end up giving up all together. 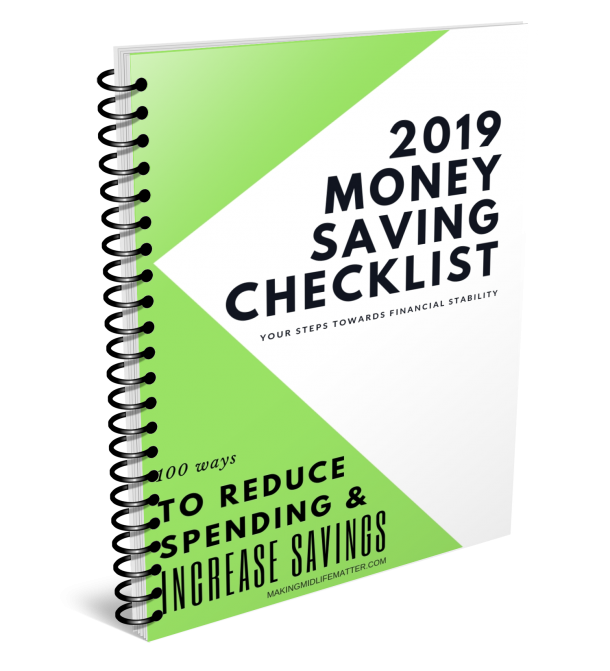 Just like starting a new diet, money saving and reducing debt has to be in the forefront of every thought and action you have. Every minute of every day, you have to think about how you can save money. I know it sounds intense but until you form some solid money saving techniques and habits, it has to be your new obsession. Until your processes become second nature to you, it has to be your focus. As time goes on, it will get easier and you won’t have to focus quite as hard to stay on track. 7. Keep track of success and failure. In step #1, you created a snapshot of your current financial situation at that moment. It does not end there. You must keep up with your logging of all of your expenses. Only then can you see your progress. Remember, any steps forward, no matter how small, should be celebrated. Not with spending of course. lol Don’t worry if your goals were too ambitious and you fell short in one month. Look for more opportunities to make up the difference the next month. 8. Be flexible and adjust. If you consistently can not attain your goals, re-adjust them. It is important to stay motivated and excited about your progress. Falling too far behind may trigger you to give up. It is better to log and evaluate your failures and adjust your figures. Conversely, if you are blowing your goals out of the water, why not move your deadline and fast track your goals. How inspiring and motivating would that be for you? Need to make extra cash to meet your goals? I earn a full-time income with my blog. And you could too! 9. Form support groups and accountability. Why do people go to the gym when they have all the same equipment at home? Why do people go to AA meetings? Why do people join and attend weight loss facilities? Because it is easier to stay on track and get motivated when you have other people who are reaching for the same goals and support you in your progress. Don’t do this alone. Find a friend in real life or an online community. Finding a support group is crucial. Not only will they be there for you with tips when you are struggling, you will find it very motivating to help others too. It is amazing how helping someone else achieve their goals, keeps you on track and accountable to your own goals. Hence the whole purpose of having sponsors in AA. Find your financial sponsor/mentor and be one for someone else. It will make this whole process easier and will make you feel really good about yourself. 10. Practice eating your peas first and then you can have desert. Did your mother ever say that to you or did you say that to your children? We live in a society where we are obsessed with instant gratification. Just as we teach our children to be patient and wait their turn, so must we be with our financial needs and goals. Every purchase and expense should be weighed against your future goals. Does this purchase take me closer or farther away from my financial goals? Can I make room for it in my goals and save for it? Can I get it used or for free through another avenue? Gone on the days where you mindlessly pull out your plastic and buy something because you want it now. Keep your eye on the ball and the end results you want to achieve. 11. Organize and declutter the rest of life. 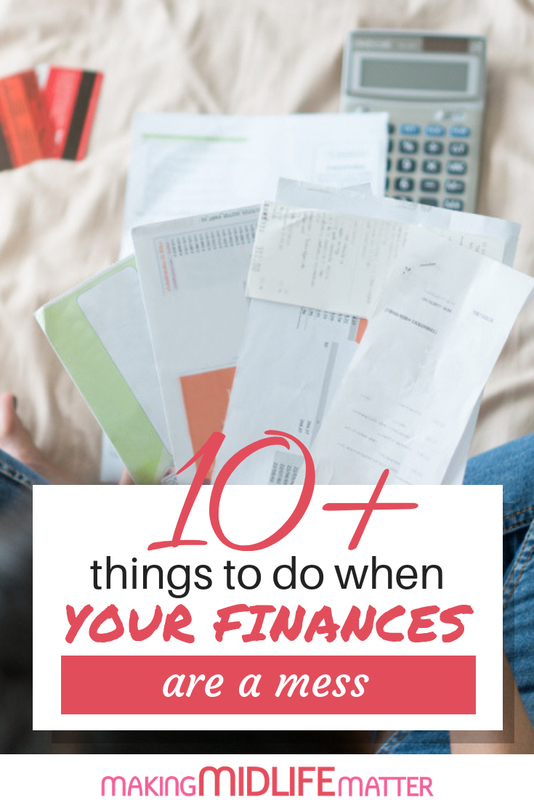 Have you noticed that not only your financial life but your physical environment is a mess too? I am SOOOO guilty of this. When I let things slide, I let everything go. A decluttered and unorganized house makes it difficult to concentrate on anything. I hope you join me on my journey to clean up my financial mess as well as my whole house. Stay tuned for more posts on budgeting and cleaning as it has become my main focus these days. I feel lighter and more focused and I hope I can help you feel that way to. Remember, it doesn’t matter how old you are or how deep your financial mess, you can make things better for yourself today and for your future.